My Signature model is relatively new and I'm very excited by it. While it is not truly a Jumbo model, its comparatively smaller upper bout does give it that appearance. Its design emerged directly from the S-45 (my very first original design). Its upper bout and waist are exactly the same as the S-45, the lines for the lower bout were extended, and the length of the body increased to 49cm resulting in an exceptionally powerful and balanced voice! 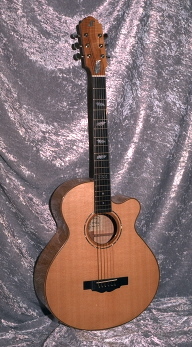 The Signature model is built 12 frets to the body as a standard feature. I utilize a "buried heel" along with any of my cutaway options also as standard features.